Can this storage unit also be mounted/affixed to the door, or is hanging over the door the only option? Yes, our elfa Door Racks can also be mounted using our Anchors &amp; Screws for Hollow-Core Doors (item # 10023062). What is the max height of a roll of wrapping paper that will fit in this? The maximum height of a roll of wrapping paper that our elfa utility Gift Packaging Door &amp; Wall Rack is only limited by the height of the other elfa utility Door &amp; Wall Rack accessories hung above the elfa utility Gift Wrap Rack. Difference from other white Elfa gift wrap storage? What is the difference between this product and SKU 10066224? They both are white gift wrapping storage solutions, but the price is slightly different. This elfa Door &amp; Wall Rack solution is created using wire baskets the 10066224 elfa utility Door &amp; Wall solution is created using mesh baskets. Will it fit a 79 1/2&quot; door? The instructions say it &quot;designed for a standard 7' door&quot; and that the dimensions are 80&quot; h. My door is only 79 1/2 inches. Will it still work? Does it fasten at the top and the bottom or hang from the top? Would I have to saw off 4 1/2 inches or perhaps just 1/2 inch? The Over the Door Hooks of our elfa utility Door &amp; Wall Rack adjust for a custom fit to most standard doors - including your 79-1/2&quot; door. How deep are these baskets, or the unit. 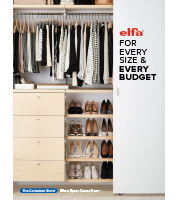 Will it fit in a normal or standard size linen closet with shelves inside? These baskets are 6-3/4&quot; deep and it depends on how deep the linen closets' shelves are. This solution is 17 1/8&quot; wide.